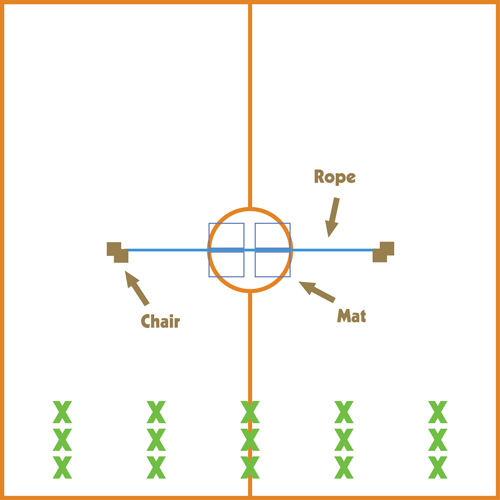 Space the two chairs across the room and tie the skipping rope between them (as in the picture). The skipping rope should be as high as the waist of the tallest person in your class. Attach the mats underneath the skipping rope so that there is a good amount of mat on either side of the rope. The object of this game is to have the whole class start on one side of the fence and then make it over to the other. They can not go under or around the fence, and can not do any acrobatics over (I usually let kids jump over if they can land on their feet, and only their feet). As soon as a single person touches the rope, the game is over and the whole class must re-start. Do it as many times as you like to see how many kids can make it over the fence, and then write your total on the board.